The zombie apocolypse is upon us, and it started with this spider. 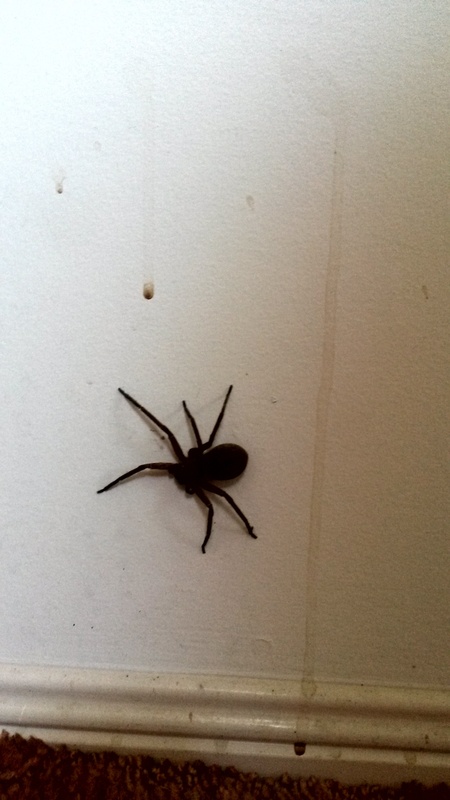 If I were a spider, I reckon the garage of our house would be a pretty safe place to live. I’d stick to the corners, eat bugs and flies, stay out of trouble. I certainly wouldn’t tempt fate by swanning about at floor level right in Boy-Child’s flight path from car to house. Too much chance of discovery, especially if I happened to be the size of a small bird. Boy-Child: WOW! Check it out! Dad, this is the biggest spider you’ve ever seen! Me: Oh, don’t be ridiculous. I’ll grab a glass and catch it. 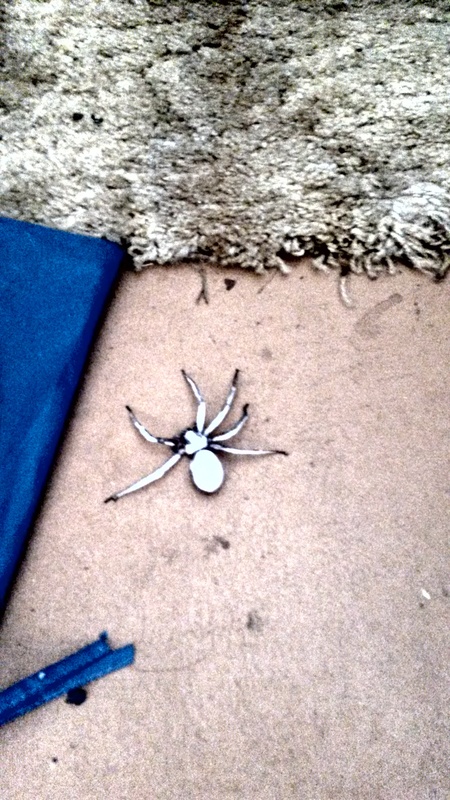 It’s just a spide- HOLYMOTHEROFDOG it’s beyond huge and I think it just made eye contact with me! In the house, now! There’s something about a giant spider who is missing two legs but still has full mobility that makes you think ‘OK. So, it’s already had a run-in with a rat or something and come out on top. The lack of limbs makes it more scary, not less’. After a calm, not at all shrill discussion held at a safe distance, we decided to just leave the spider alone. Surely if we didn’t disturb it, it would just keep on minding its business and eating flies. It’s not like spiders go out of their way to scare humans, ha ha ha! And besides, my husband pointed out that the swollen abdomen was probably just full of eggs, so it was technically a much smaller spider than it appeared. These are the lengths of self-deception we’ll go to in order to avoid dealing with a problem. Inspiring, isn’t it? I waited until it was near ground level and not going to fall on me, and gave it a couple of squirts of bug spray. Done! Spider falls to the ground and lies there twitching a couple of legs. I go back into the house to grab the dustpan. I nuke her again. I spray and spray until every part of her is covered. 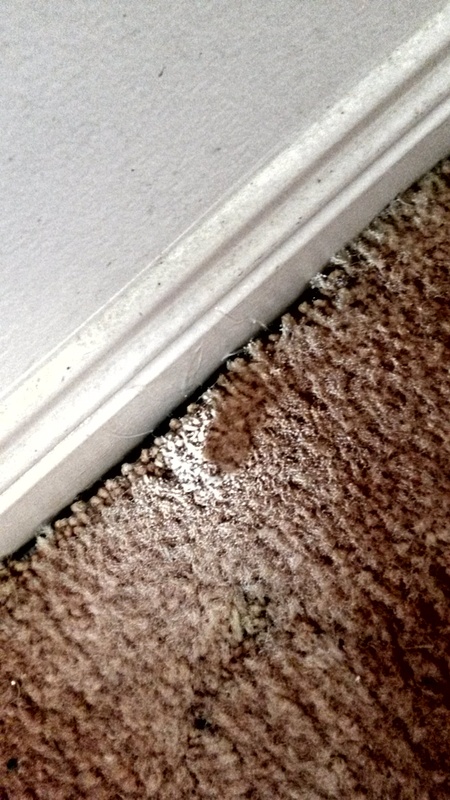 She twitches a bit in irritation, then starts walking off again, leaving tiny white bug-spray footprints behind her. Suddenly, I remember. Alison at What Mum Should Have Told Me had an entire post about spiders that I read just yesterday. Spoiler alert: her badass mum defeated a giant spider with a combination of stealth and vacuum cleaning. I can sort this out. Easily! We even have a ducted vacuum system with a socket in the garage! I grab the hose. I point it at the gargantuan spray-soaked spider. I activate the switch. The beast does its best to run away from the suction, but is no match for the power of Lux. SCHLUMP! As foretold, its plump body makes a satisfying noise as it disappears up the pipe. 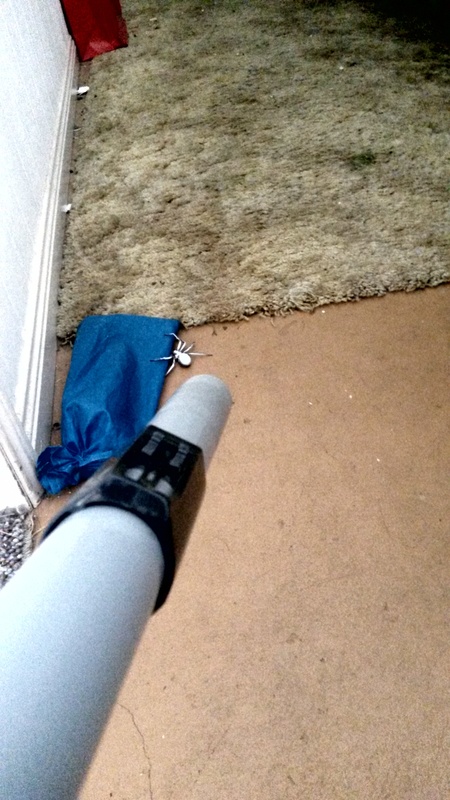 I’m slightly nauseated when I feel its body get stuck and its legs scrabble momentarily in the hose beneath my hand, but the suction again wins out and the vacuum cleaner is triumphant. As am I, at last. Until that night, when I dream that Mama Hairy Legs has survived her trip through the ducted vacuum, and is even now plotting her revenge from the bowels of the dust collection bin. I envisage her eggs hatching in there, and an army of undead baby spiders stealthily making their way back up the duct pipes and surging en masse out of the hose sockets at either end of the house to pay me my dues. *Okay, maybe the scale is adjusted in that photo just a tiny bit. The spider was still effing huge. Ten reasons why a sensible person would buy a dog instead of having a baby. No, no! Many thanks for sharing your post in the first place – I never would have hit on the vacuum cleaner idea on my own! Without you I’d probably still be trying to bludgeon the damn thing to death with a thong right now, with it taunting me Monty-Python-style; ‘Come on then! This is just a flesh wound! Is that all you’ve got?’. Brrrrrrrrr! 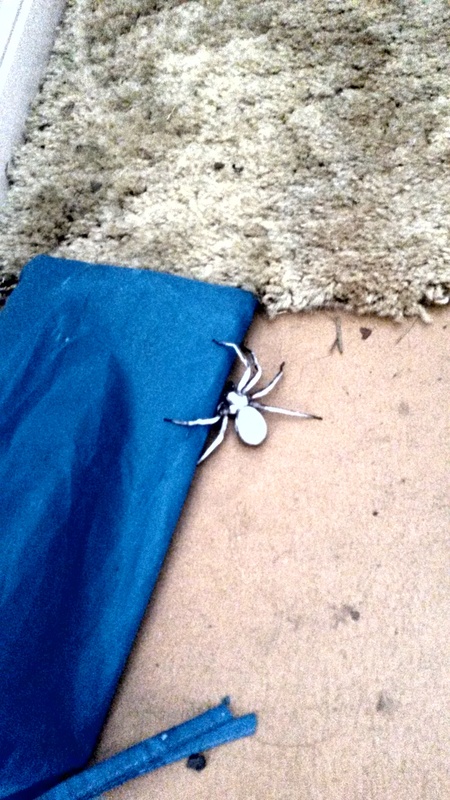 Shivers down my back here….omg big spider. This is seriously terrifying. You are way braver than me! Ha. I don’t know about brave. I didn’t document all the breaks I had to take for dry-heaving while I was writing this post. I still feel a little twitchy every time I scroll past those pictures. Brrrrrr! I did the same while reading it! It looks like something out of a horror film! Wow. Even without the… ahem…undoctored photo with your daughter, that is a really huge friggin’ spider! I would not have slept well either. I HATE those things! Feeling it struggle to crawl back out of the vacuum hose. Ugh! Gave me the chills. I felt naseous with you! Thanks for the entertainment. Kind of like watching a horrific car crash. I’m following you now, and I even made it so your posts come to my in-box instantly. Yep, I’m going to be one of those–reading your posts every time and probably even commenting. Aw, man. You FOLLOWED me? And you plan to read my stuff and respond to it? I hate when people do that! I hate when you come across a spider like that that can’t be squished. And certainly a tissue would never work. Normally, if it was in the garage I would simply step on it, but that sucker looked like it would just stand back up and carry me away with it. Yep, hours later, I’m still thinking about it. The image of it still crawling with its whitened back will haunt my dreams tonight.